At ICMS we are dedicated to your education. Our learning and teaching principles underpin the design, development and delivery of our curriculum to enhance the student learning experience. These principles are our promise to: encourage contact between students and faculty; develop cooperation among students; encourage active learning; give prompt feedback to help students improve and develop their understanding; emphasise time on task and effective time management; communicate high expectations; and respect diverse talents and ways of learning. These principles are our commitment to getting the best from you. Learning and Teaching is a vibrant and dynamic process that requires students to engage with basic and higher order knowledge, gained through experience, understanding and analysis. At ICMS we use constructivist teaching and learning methods. This simply means that as a student at ICMS you are actively part of your education. We motivate you to think critically and be an active participant in the learning process. This complements our applied and experiential nature of learning in the areas of professional services management. You will be learning directly from industry experts. Our faculty is made up of highly experienced academics with industry and professional experience. ICMS has strong industry links, making for a unique and highly rewarding educational experience. Our close connections with industry and our dedication to training our students to be work-ready professionals, ensures that we are at the forefront of education in professional services management. We are not afraid to break new ground to ensure that our curriculum is relevant, practical and visionary. ICMS also prepares our graduates to work in a global economy and cultivate the value of integrity, responsibility, community engagement, and sustainable approaches to business and society. ICMS caters for individual learning styles in an environment where innovation and social relationships are paramount. ICMS embeds employability skills across all courses and offers a unique combination of theoretical and practical knowledge in a student's chosen field of study. This is further developed by a comprehensive industry training program (structured on work integrated learning principles). 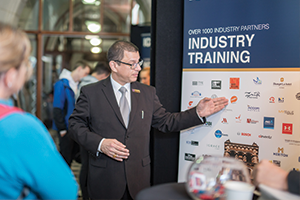 This gives our students a head start in industry before they have even graduated.